This review first appeared in the February 2010 issue of hi-end hifi magazine High Fidelity of Poland. You can also read this review of the Linn Klimax DS in its original Polish version. We publish its English translation in a mutual syndication arrangement with publisher Wojciech Pacula. As is customary for our own reviews, the writer's signature at review's end shows an e-mail address should you have questions or wish to send feedback. All images contained in this review are the property of High Fidelity or Linn - Ed. Imagine being an engineer who’s hit the wall with a design. He can keep working on improving and enhancing it but it will still keep him on this side of the wall. To make a real breakthrough, he has to take a risk and go places he hasn’t before. That’s how the greatest ideas are born and how progress is made. This applies anytime anywhere to anyone who does great things. One of those people is Ivor Tiefenbrun, owner of Linn. I still remember how excited I was when I first listened to his Sondek CD12 HDCD player. It was designed out of Ivor's love for vinyl and proved how skillful and ambitious Scots could be. Now discontinued, it was a brilliant and beautiful device that offered the highest sound quality. When it came to improving upon it however, there was the wall. Ivor maintained how it was still possible to design a better player – if it were SACD. But it would be just a small step, not a true leap forward. The unexpected solution came from Linn Records which are part of the same corporation but deal with recordings and selling music. They had amassed a great archive of high-resolution master tapes. The next logical step was the creation of a professional internet store where anybody could buy this music in almost any conceivable format including files almost identical to master tape (almost - not all new 24/192 recordings are really master tapes as Linn began mastering direct to DSD years ago). I just learned that Linn presently is the largest remaining SACD label in the world! That's why some of their 24/192 and 24/96 recordings are in fact conversions from DSD to PCM. When the wily Scots realized that Sony no longer cared about their own technology, they moved from DSD to DXD to now record at 24-bit/384kHz PCM. This is down-converted to 24/192 for public consumption since to date, DXD remains exclusive to recording studios. Audiophiles don't yet have the means to play back this format natively. Hopefully this will soon change. The main difference to a CD player is that you only need a CD once to rip it to hard disc. Our domestic Linn distributor delivered the Klimax with a German RipNAS which upon insertion of a CD automatically rips it to two internal HHDs (primary storage and backup) as FLAC files. 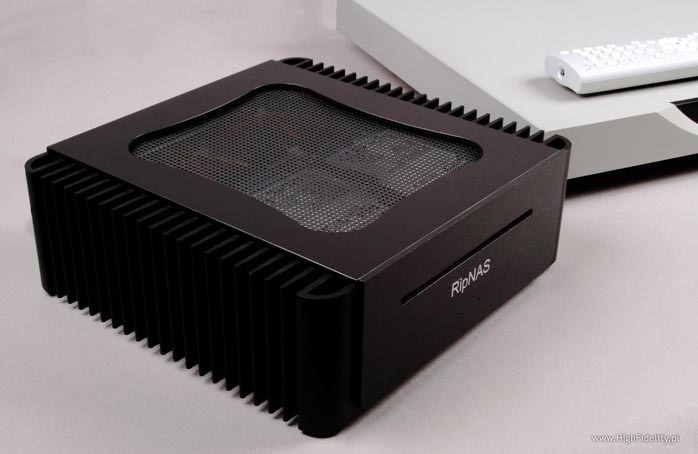 The RipNAS extraction software is the same dBPoweramp CD Ripper I also have installed on my notebook. Using it imports a standard CD in less than 4 minutes and decodes HDCD in 24-bit resolution. The final result is a bit-perfect FLAC copy. 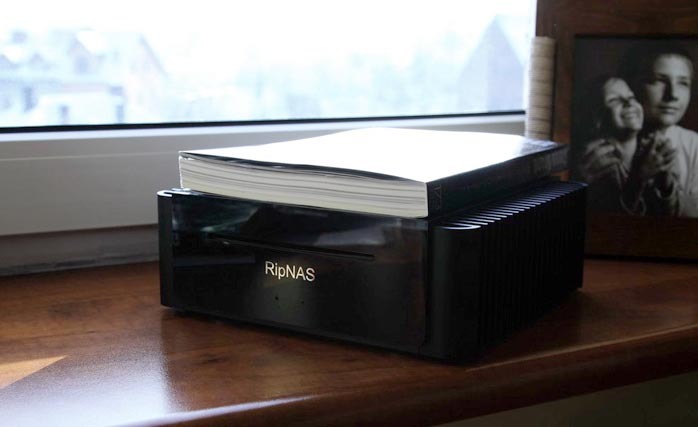 High-resolution files are sent to the RipNAS from your computer via cable or wireless. This might sound complex but is very simple. The second difference of the Klimax DS to a conventional CD player is the lack of any control knobs. There is only a small display showing artist name and song title but to be honest, they might as well have skipped the display. You can show the contents of your music library on your far bigger computer screen (Linn’s custom software for that is called KinskyDesktop), on your iPod Touch or iPhone or on a touch-screen tablet. Playing back files is even simpler than playing back CDs. Of course CD users have engrained habits so for me personally it was easier to play files from the Bladelius Embla and Naim HDX whose touch screens and front panels made them more similar to CD player. They don’t require a computer or attached network device to work. The Klimax DS is compatible with 24/192 files, the FLAC, WAV, AIFF and MP3 codecs and Internet radio. It is also upgradeable via free software patches. Linn is one of the very few audio manufacturers who work hard on refining their own software and pass on advances to their existing customer base free of charge. What’s more, customers have access to Linn’s own record label and Internet music store. This combination of hardware and software production plus the knowledge how to best interface the two puts Linn in a unique position and creates an obvious advantage in the market. Watching developments at Linn and listening to their machines arrives at only one possible conclusion - Ivor is making the most of this accumulated know-how. 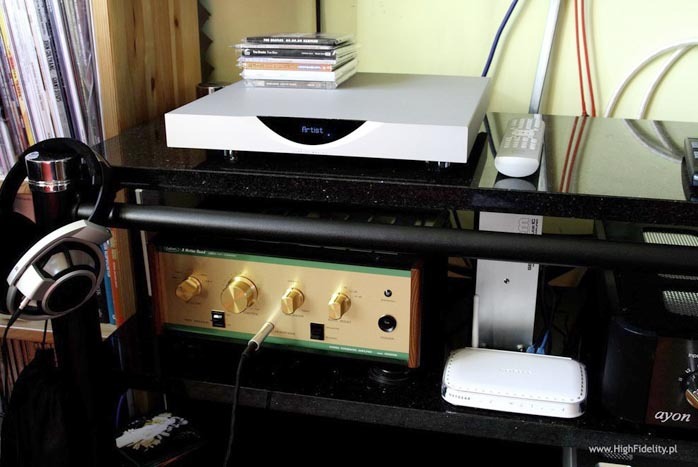 The Klimax DS is the top model in Linn's range and one of the most expensive such machines. Its design deliberately mimics the legendary Sondek CD12. The Klimax differs in size and due to solid aluminum construction, weighs even more. There’s a blue display on the front and interface socketry—Ethernet, gold-plated Neutrik XLRs and WBT RCAs—on the back. As usual for Linn, the signal enters unbalanced but for the outputs, there are Lundahl transformers with dedicated secondaries for XLR and RCA outputs. This allows simultaneous use of both outputs and simplifies the output stage by eliminating active DC servos. As super professional as it all looks, I missed digital inputs. True, there was the RipNAS and one could of course use a computer but old-fashioned me would, from time to time, like to connect a traditional CD transport to the Klimax’ digital processor. That’s just personal of course and the only nit I could come up with after a visual inspection of the machine (so far I’ve reviewed Linn’s Classik Music and Majik 109, the Majik DS, Majik CD, Majik-I and Akurate CD). Sound: I ripped recordings to the RipNAS and sent them wirelessly to the DS. I also played back the same files from my computer using the Wavelength Audio Cosecant v3 USB DAC. I also played back the original recordings from my new Ancient Audio CD player which first was to be called the Prime SE but being a completely new platform, will probably end up going by Air. Comparing these different playback means built up a story in my mind but as usual, such stories are filled with shortcuts and emotions. I’ll thus approach this assignment differently than usual and hinge my impressions on specific recordings to make the results clearer and more unequivocal. In my opinion that’s important. The Linn Klimax DS is as revolutionary an audio milestone as The Matrix flick was for the movie industry.